Each pack contains 50 premium Blue stripes Kraft paper bags. 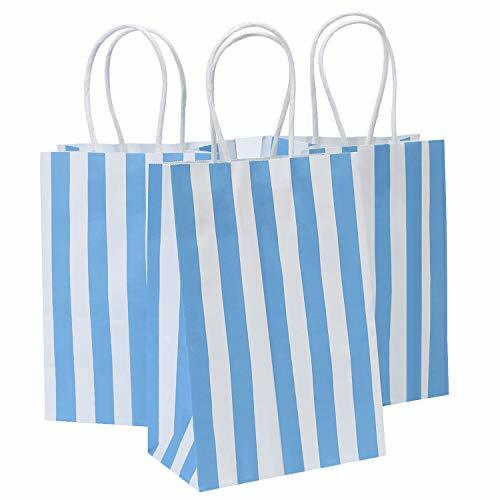 Buy your supply of bags now for same day shipping.✔Strong and Versatile Bags: They are strong and sturdy paper bags that can carry at least 3lbs of weight easily.These bags are made with thick plain blue stripes kraft paper and have a strong rope handle. The box type bags have a flat bottom so they can stand well. ✔Multipurpose Paper Bags: Size: 5.25×3.25×8 inches, Road plain small paper bags can be used for a variety of purposes. Road kraft paper bags should be your first choice.